Shares in Solazyme, the makers of algae biofuels and algae-based oils and chemicals used in health and beauty products, began trading on Nasdaq under the symbol SZYM.O on Friday. The business set an initial public offering price at $18, but its stock opened at $20 and traded between $19.60 and $22.00 throughout the day, with 10.98 million shares sold, raising about $197.6 million for the company. 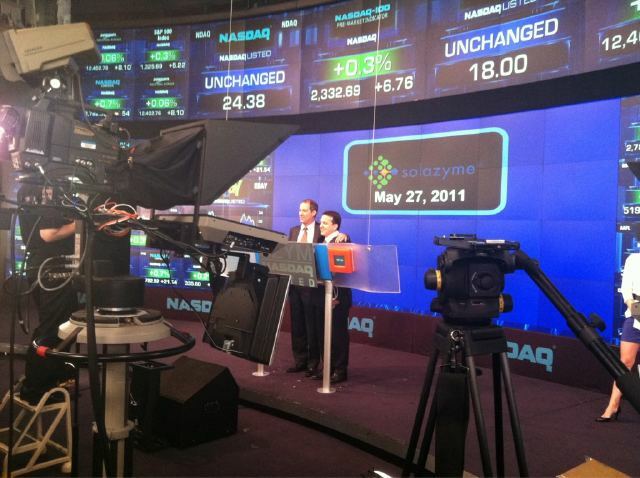 Solazyme’s S-1 filing on March 11, 2011 confirmed its intention to go public, officially. Speculation about an IPO for the company preceded that by many months in the cleantech industry, however. Algae-derived marine and jet fuels made by Solazyme have been used and tested by the U.S. Navy. Prior to going public, the company also sold dietary supplements and skin care products, made from algae-based oils, via retailers including: Whole Foods, GNC, Sephora and QVC. It also struck deals to expand production and sell its fuels and oils to Chevron, Dow Chemical, Unilever, and Qantas Airlines Ltd. Founded in 2003, and headquartered in South San Francisco, Solazyme’s venture investors include: the Roda Group, Braemar Energy Ventures, Lightspeed Venture Partners and Sir Richard Branson, a well-known advocate for the use of renewable fuels. Competitors to Solazyme include biofuels makers like Gevo and Amyris, also public companies, that convert plant-based sugars — from sugarcane and other starchy crops, rather than algae — into fuel and oils that can displace petroleum-based products. Other privately held cleantech startups in the algae biofuels space could prove significant competition. One interesting player, LiveFuels, is a next-generation fishery and biofuels maker, that uses living fish to process all forms of algae, and then presses the oil out of the fish before selling the edible fillets. LiveFuels’ business would avoid the cost of phosphorous — which is used in food farming, and is in shorter and shorter supply these days, globally — through its unique methods; but the company has not scaled up to commercial sales of biofuels and fish, yet. Several others that have already begun to produce and sell biofuels from a variety of feedstocks — including food waste, jatropha, sugarcane and algae — have struck huge partnerships with, or drawn venture investments from traditional oil and gas companies, already. A few examples: earlier this month, BP Alternative Energy Ventures led an investment round of $9.4 million (out of a targeted $15 million) in Verdezyne, a startup using yeast to produce biofuels and chemicals; in June 2010, Cargill and Shell led a $46.4 million investment in Madison, Wisconsin-based Virent Energy Systems, the makers of biogasoline; and Synthetic Genomics, which is genetically engineering algae for biofuels, attracted a $600 million research and development deal from Exxon in 2009. On May 24, the U.S. federal government announced plans to “Contribute to meeting national goals of reducing oil imports by one-third by 2025 and putting one million advanced vehicles on the road by 2015,” by making all of its new, light duty vehicles — leased or purchased by agencies — “alternative fueled vehicles” by the end of 2015. That government definition includes hybrid or electric, compressed natural gas, or biofuel vehicles — that’s good news for Solazyme, and its competitors.